I don’t know how many of you get The Kent Record Courier, but they have a little magazine called Relish that comes with the Saturday paper. 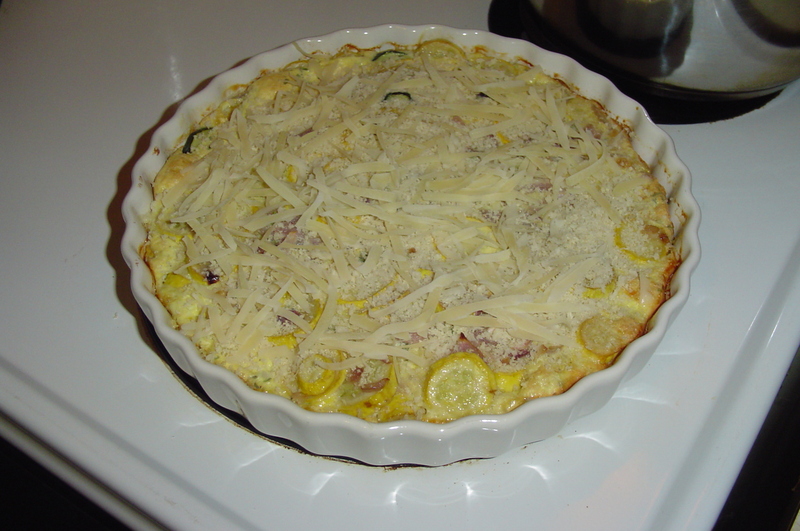 In it this week was a recipes for zucchini. It called for yellow & green squash, but I had a lot of yellow from Matt’s farm. I think this is something that the back to schoolers will like because it reheats well. Recipe: 3 tbsp butter, 1 tbsp olive oil, 1 med onion chopped, 1 garlic clove chopped, 2 lbs zucc squash, 2 lbs yellow squash ( I just used all that I had) sliced, 3 eggs, 1/2 c half & half, ( I used fat free and it was fine) 1 tsp salt ( I did not put this in),1/4 tsp pepper, 1 tbsp fresh thyme leaves, 1/4 c panko breadcrumbs, 1/4 c grated parm chees. Preheat oven to 350. Heat butter & oil in large skillet. Add onion & garlic and cook 2 min. Add squash. Cover and cook over med. heat 15 min, stir occasionally. With a slotted spoon, transfer mixture to a butter 2 qt casserole dish. Combine eggs, 1/2 & 1/2, s&p and thyme. Pour over squash and mix well. Bake 35 min. Remove from oven, top with panko & cheese. Under the broiler until brown, about 3 min. Oh, and the picture of Nana and Marilyn has nothing to do with food, I just like it. 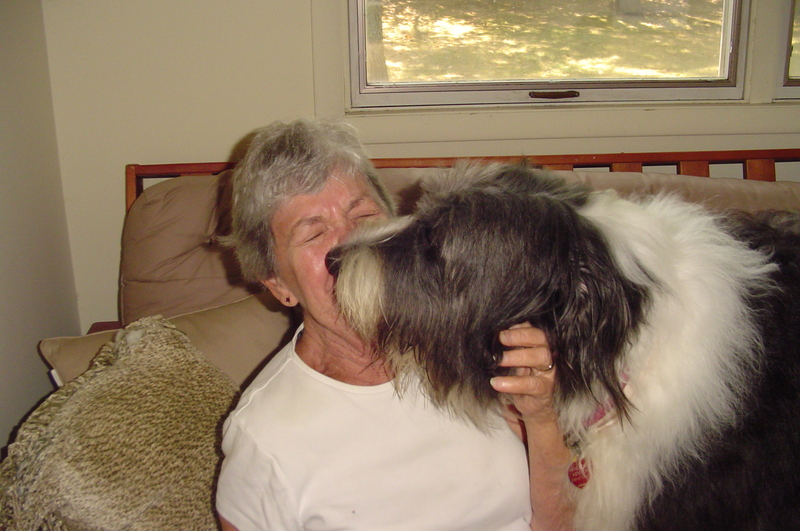 Marilyn is giving Nana some kisses! Breathe Nana! This entry was posted in General on September 4, 2011 by andrewsbeth. I love the picture of grandma and marilyn….so cute. Don’t worry grandma, the dog would plow me over too. C & K, have you seen the big St. Bernard walking in our neighborhood yet….so cute and soooo big! No, I have not, and I don’t think Kim has seen him either. When I was little the Hungerford’s on Crain Ave. had a Saint Bernard that Bethy and I got to take rides on! I thought that was the greatest ever, until we got our pony. Marilyn sort of reminds us of a Saint Bernard, and she is as sweet as one too. I love any kind of quiche or pie kind of meals to reheat at school. I should try this one- this week I am making an easy spinach pie because I had so much cheese to use up. Didn’t we get a great haul from Matt this week?